My friend Dave Curtis tells me that the Steam Engines have chugged out of the station and now Suffolk Maid's got a new series. What is it? Well, it is a collection of Land Rovers. 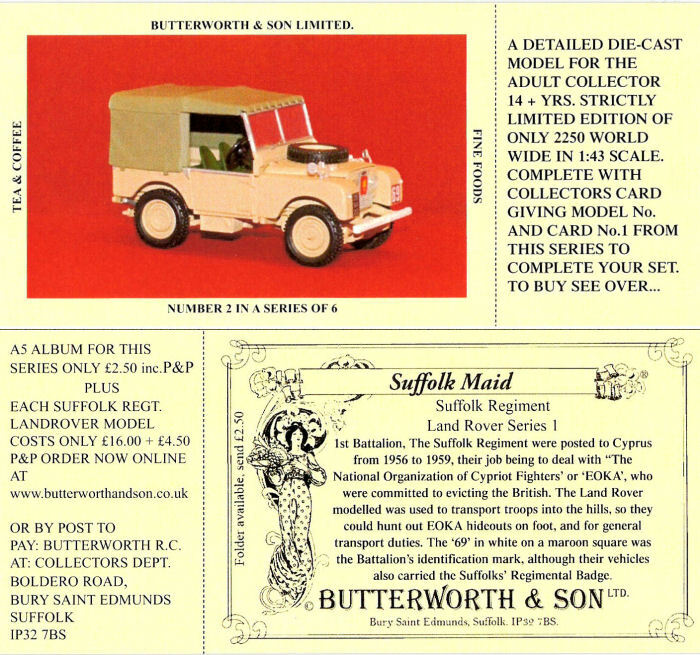 In addition, they are offering an album and models of the rovers if you will. The set consists of 6 cards and a model is offered. These cards are a bit longer with the model offer that can be trimmed off. It's nice to know that someone in the UK is carrying the torch. We lost Tuckfield in Australia and now we only have Suffolk Maid in the UK. The models are a nice touch too. Again, thanks to Dave for the update on current issues in the UK. Also thanks for the wonderful scans. Here is one of the six cards. Nice stuff!